iBeacons - should we be pushing or pulling content? iBeacons are causing quite a stir at the moment with a flurry of major companies, including airlines, retail giants and arts venues running trials and pilot schemes trying to work out how they can be employed, the benefits they may bring and how consumers react to the geo-position enabled devices. The key battleground, as we see it, is the contest between enabling customers to pull context-relevant information when they want it vs. companies using the technology to push information. The push model seems to have the negative potential to become intrusive and marketing led. iBeacons are small, low cost, location transmitting devices, that can be installed in fixed locations within the built environment to talk to smartphones via Bluetooth Low Energy (BLE). They have the advantage over GPS in that they work inside and therefore can enable smartphone apps to trigger personalised messages and bespoke content to users when they come within close proximity to the beacons. In essence, the beacons provide the user with location sensitive information/content that has not before been possible within buildings. It also enables the provider to monitor where people are – for example, as shopper walks into a store or a passenger nears a check-in area. Recently Tesco and Waitrose have both been running pilot schemes at single store locations with an expressed aim to boost customer shopping experience. 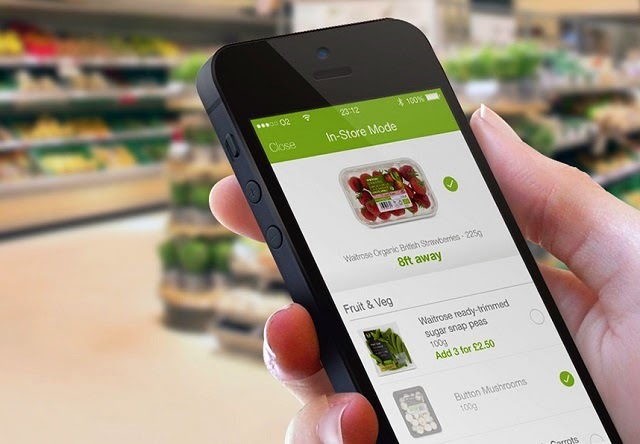 Waitrose have developed an in-store mode to its app which, via the beacons, enables users to receive in-store offers as they approach particular aisles or food counters, read product reviews and add and collect items in a virtual shopping basket. In another camp, Tescos are playing it more cautiously. Their trial is initially being used to deliver pop-up reminders to customers to pick up pre-ordered items as they walk into the store. Tesco have said they will be holding off pushing promotions, for the time being, over fears it could scare customers away from using the app if they are bombarded with messages. Meanwhile in France, supermarket giant Carrefour have jumped in with both feet in its flagship Paris store, installing 200 beacons, which automatically open the Carrefour app upon entering the store then enable shoppers to be guided around the store in the most efficient manner to collect items from their personal shopping lists and/or recipe ingredients they have selected on their app at home. Their intention is to soon send geo-push coupons and offers to shoppers’ phones based on their location in-store and buying profile. Provide additional information about an exhibit to bring it to life. For example a video or sound clip describing the details, inspiration and interesting anecdotes about a painting. Augmented reality allowing the viewer to look back in time at the interior of a room via their smart phone screen. Present information in a large range of languages rather than the sometimes limited set on printed information. Provide suggestions of other artwork or pieces within the gallery based on items the viewer ‘likes’. Provision of contextual info which automatically pops up as the viewer walks past a painting/exhibit making interaction effortless. The viewer chooses whether to engage with the pop up…. or not. Provide dynamic routing around large exhibits and communicate proximity to facilities. Airports are busy transport hubs, with high passenger numbers who all have to abide by a set process and schedule. The airport also has a multitude of facilities, from retail, to dining to leisure. Within this dynamic and inherently multi-cultural environment there are opportunities for the application of technology and iBeacons to simplify or enhance the journey. 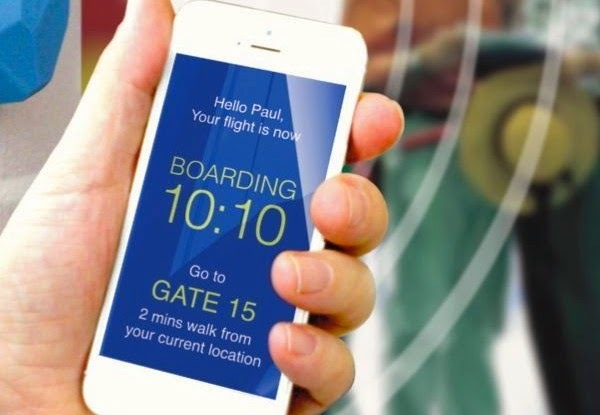 SITA have recently published their research findings on the use of iBeacons in airports. This includes automating the push of boarding info, automatically bringing passenger boarding card onto the smartphone homescreen when nearing checkpoints and advising passengers of the “rules” (e.g. remove liquids and laptops from your hand baggage) and informing arriving passengers of baggage timings and reclaim belt details. Easyjet are also trialling iBeacons at three of their key airports allowing users of the Easyjet app to receive updates and personal info at key touchpoints. These include where to drop off oversize luggage, and personalising live boarding gate info to save passengers having to stare at departure screens. Virgin Atlantic are also on board with an iBeacon trial but appear to be pushing the envelope further with push notifications sent to passengers informing them of partner company promotions such as a currency exchange offer as they pass the TravelEx. They are also aiming to push notifications to passengers in the Virgin Club lounge when slots in the Club spa become available. All of these trials and ideas show that there are different views and a very careful line to tread here between engagement and bombardment. 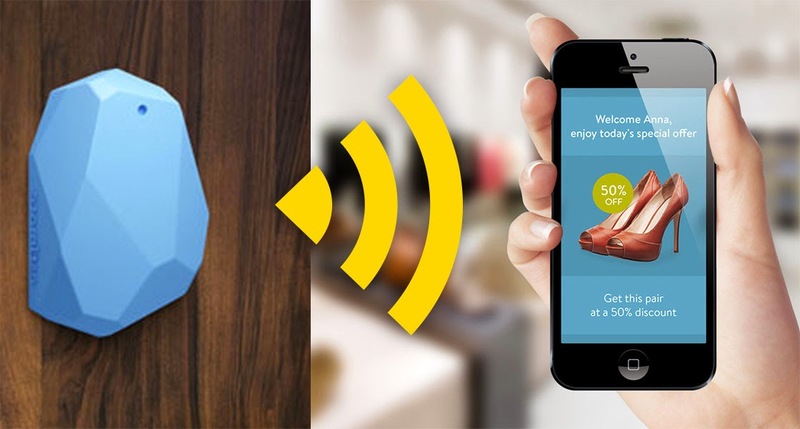 So, are iBeacons the future of customer experience? They certainly seem to offer an interesting opportunity to engage and communicate important useful information to users and to aide supporting navigation around indoor spaces. In the arts sector they can unlock whole new channels of information and entertainment. Most powerfully is what they can do in the provision of accessibility information and aiding navigation and travel information for hearing or sight impaired travellers. However, there are clear concerns that the usefulness could easily be eroded by overzealous use for pushed marketing notifications. Features which enrich the users experience or make it easier and reduce time queuing are positive and should be developed further. Language selection inline with the users smartphone could really aide international travellers who may sometimes struggle in foreign buildings. Geo-position targeted messages should not be use as a mass marketing tool. If it begins to feel like location targeted spam users will soon switch off and disconnect. Automatic pop up of a feature that the user needs to use - such as a boarding pass is good, automatic pop ups of adverts is not. Use of digital content should be seen as supplementing physical signage and displays within the building, NOT replacing. Physical signage communicates to all, not just those with smart phones and selected apps. iBeacon features have the potential to deliver accessibility information to passengers/users with hearing or sight impairments to help them navigate and access travel information. We see this as a genuinely powerful and positive use of the technology. A Guardian article about a study of the use of intense electric lights to improve performance of students in Sweden and our recent work with the design office team at CERN has got us thinking about the way technology can be used to enhance how people experience a workspace. In particular we have been considering what technological interventions could be considered when there is a scarcity of natural light or views to the outside world. The Guardian article describes a study at a school in the North of Sweden aimed at determining the effects of “full spectrum” electric light on the experience of a dark Nordic winter as well as on hormone level changes caused by long nights and short, gloomy days. The study will gather much needed evidence of how artificial light can counteract problems associated with living under such conditions to help people perform better at school and, by extension, in the workplace. The article cites other similar studies but underlines the fact that firm scientific evidence of this nature is thin on the ground. Although there is much anecdotal evidence in this area it often lacks the power to sway purchasing decisions. The fit-out works that have followed our work to redesign the workspace occupied by the design team at CERN are now almost complete and one of the meeting rooms features illuminated ceiling panels that display a sky scene. The ceiling panels installed at CERN are by Sky Factory and are slightly recessed into the ceiling grid to make them look as similar to skylights as possible within the limitations of the space. For the staff now using the meeting room they give a sense of the outside world in a space that, because of building constraints, features nothing else that links them to anything external. In this context they are undoubtedly a positive addition, helping people to feel more comfortable in the environment than they would otherwise in a windowless space. More often than not, workspaces include some windows but we think that even if that is the case, technology like the Sky Factory products can sometimes be a valuable feature. There is a fairly substantial amount of evidence that they can significantly influence the way people experience a space, making it feel more spacious and producing a physiological relaxation response. A lot of this is thought to be due to the imagery displayed by the ceiling panels which has been found to help relax people and even contribute towards easing stress. All of this evidence supports the notion that this can directly benefit staff wellbeing and productivity but is largely based on anecdotal data. The most subjective data currently available appears to come from studies in medical facilities. These have found these sky window-type products ‘can create a hyper-real illusion that has the power to elicit the same psycho-physiological relaxation response that occurs when we view real sky’. So, it seems that if installing this sort of technology in workspaces can elicit positive responses that could directly improve human performance at work, organisations should at least consider how they might incorporate them into their spaces in order to reap the benefits. An example of an area of a building where these products could be most valuable is the area around the architectural core. Floor plans often feature open plan spaces arranged around the perimeter of a building so that users who often spend a lot of time in these spaces can make the most of views to the outside and capitalise on the benefits of natural light. This often results in a level of compromise for some of the meeting spaces that consequently end up near the core of the building and may have some borrowed daylight but are generally quite devoid of views to the outside. In such cases, these or similar products could bring the meeting spaces a much needed connection with the natural world at the same time as making the room feel larger. For people who often spend extended periods of time in meetings during the working day this could be beneficial to maintaining their natural body clock or ‘circadian rhythm.’ There are studies relating to the use of sky windows in medical facilities which suggest that the Luminous SkyCeiling product can help re-establish or maintain patient’s circadian rhythms while in ICU which significantly contributes to the healing process. Whilst medical facilities may be quite an extreme example, the evidence gathered from them could suggest that similar, but probably less pronounced, benefits could be achieved in other environments. With our work often requiring us to consider the impact of shift work (especially in 24/7 control rooms and contact centre environments) we are particularly interested in the prospect of using lighting products to explore how the natural body clock could be influenced in order to keep users alert at the right times. Coupling this with a (perceived) view to the outside world could enable significant change in the way users experience this sort of shift work. The biggest challenges are probably to make the imagery convincing enough to fool the body clock of users and that the lighting changes are sufficient to improve performance, without risking people ending their shifts at work insufficiently aligned with the time of day in the real world outside. If this kind of technology can have such an impact on the way people experience workspaces and consequently improve how effectively they use them, can other technology be used to similarly positive effect? If so, which technologies are likely to have the biggest impact? Could some lights change peoples’ perceptions and bring about more positive physiological responses to spaces? Biodynamic lighting is well known to be an effective way of varying the quality and quantity of artificial light to mimic the rhythm of natural light and have a positive impact on vision, the biological clock and health & wellbeing. Biodynamic light technology is often used for therapeutic reasons, treating existing conditions. Maybe it is time for it to become far more prevalent in it’s preventative role, maintaining good health and wellbeing at work to reduce the chances of some conditions developing in the first place. Companies like Waldmann and PhotonStar are innovating technology to control light in a more automated and dynamic way, supporting a variety of ways of working and adapting to changing occupancy levels. This means that there are opportunities to create spaces that not only improve comfort but also help people to use spaces in a more productive way. Maybe we will even start to see more spaces akin to the Aurora light room mentioned in the Guardian article, dedicated to supporting wellbeing, which in turn contributes to improving performance. 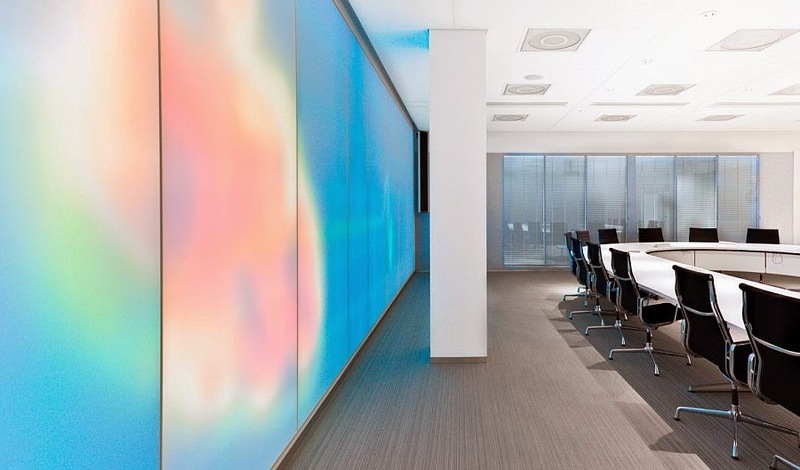 Luminous textiles, like those by Philips provide another technological opportunity and gradually accumulating evidence that the experience of a workspace can be improved through clever use of technology. The Philips luminous textile range includes options for a variety of fabrics, colours, dynamic content and sounds whilst bringing benefits that many other lighting products don’t (e.g. acoustic absorption). Again, a substantial amount of the research related to these products originates from their use in medical facilities. For example, an interesting case study piece explains that they have been found to be very effective in improving the experience of women in labour at a hospital in Denmark. The gradual iterative improvement and tailoring process that has been followed to optimise the technology for that particular environment could be replicated for other environments. Maybe workspaces where stress levels can be very high at times (e.g. emergency service contact centres) could benefit most from this tailoring approach. In workspaces with a scarcity of natural light or views to the outside world, some technological developments offer a range of interventions that could make a real difference to the way people experience a workspace. Evidence of the benefits of each is being compiled gradually but clearly points towards a number of psychological and physiological benefits. The greatest challenges ahead are in applying these in appropriate and effective ways to make best use of them in supporting people at work and proving a genuine return on investment.